On Boxing Day, I was invited by my good friend Dave – the Big Man – to Chelsea to see my team, West Ham, to take on the League leaders. I was a little more optimistic than usual – after all we were fourth in the table, our best position in the top league at Christmas since 1985, the season when we eventually came third. Sadly, English teams were banned from European club competitions, after the appalling Heysel Stadium disaster of 1985, when 39, mostly Juventus, supporters lost their lives at the Liverpool v Juve European Cup final. The European authorities finally lost patience with years of English football hooliganism and banned the clubs for five years. Some clubs, like Everton, who won the English first division twice in that time, and West Ham, with their best ever finish, suffered from not being able to build on their success with European competition; but let’s face it, after Heysel, no-one felt like arguing about it. Thankfully we now live in a very different world. So, on Boxing Day, with the District Line shut over Christmas, so no-one could get to the ground on the tube, I set off, planning a brisk walk from Hammersmith to Fulham Broadway, the location of Chelsea’s ground, Stamford Bridge. (So Chelsea are in Fulham, not Chelsea, just as West Ham are actually in East Ham!). The walk took about forty-five minutes, down the Fulham Palace Road and beyond,through territory that felt like the set from “Minder”, the quintessential comedy underworld series, full of spivs and gangsters, set in West London. I popped into a bookies on the way to put £10 on a West Ham win. 7/1 in a two horse race, 1st against 4th! I met Dave inside the Chelsea grounds at 10.45, ready for a two hour slap up breakfast before kick off at 12.45. Dave has a share of a couple of tickets that involve hospitality, and very hospitable it is too! 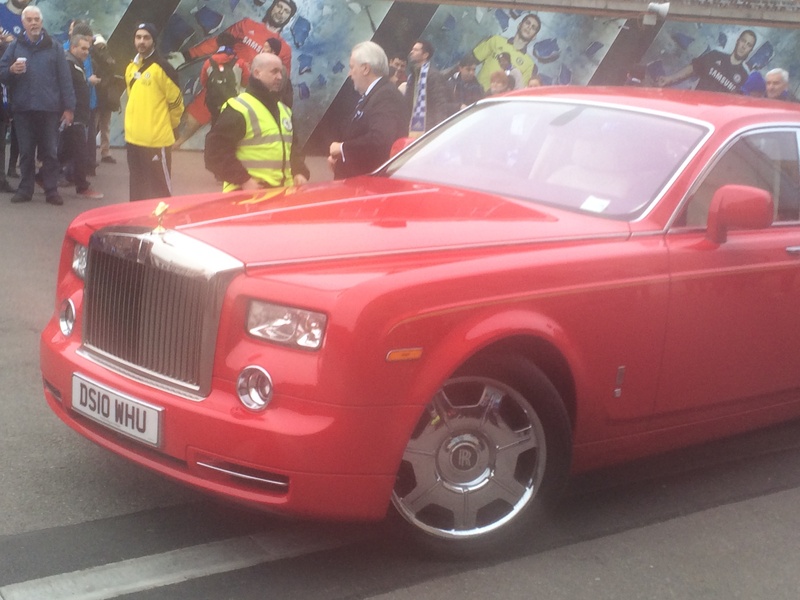 As we lingered outside the stadium itself, a red Rolls Royce suddenly appeared. Out of it stepped the diminutive figure of the West Ham co-chairman, David Sullivan. Dressed in black, with grey suede shoes. Impassive stare, as bewildered Chelsea fans watched him. One of the two Davids – the other David Gold – who rescued West Ham from their financial dark days. Now we are heading for residency at the Olympic Stadium in Stratford, and the future is bright. You have to admire the brio of the man – red Roller and number plate that combines his own initials with those of the team. Not afraid to show off! (The geezer in the picture is the driver I think, not DS, who exited quickly from the back). The first half was all Chelsea. I was a bit disappointed with Big Sam’s tactics. Showed he didn’t quite believe in himself and the team yet. Instead of playing with the adventurous formation that has taken the team to fourth place, he retreated into a crabby 4-5-1 which left Andy Carroll isolated as centre forward, and Stewart Downing, a revelation at the tip of a midfield diamond, shoved out onto the right wing, where he hardly saw the ball. And Alex Song and Diafra Sakho didn’t even start. The caution also meant that the majestic Cesc Fabregas could stroll around in deep midfield for Chelsea and thread perfect passes, long to Costa, short to the indefatigable Hazard, Willian and Oscar, with hardly a challenge. And if anyone tried, the awesome Matic was there to sort it out. We were defensively quite solid though, and so, despite all the Chelsea possession, we were only 1-0 down, to a John Terry poke-in, at half time. A West Ham free kick is spooned over the bar. Back to the restaurant for a quick lager and a bite of a rather unappetising turkey stuffing pie, Dave and I got back for the start of the second half – just. I always remember a brilliant European Champions League tie a few years ago, Chelsea v Barcelona, when we missed the only goal of the game, scored by Didier Drogba, which went in about a minute into the second half! So we’d learned our lesson, but most people in the restaurant hadn’t. For about five minutes we were surrounded by a sea of empty seats. What Roy Keane notoriously called the “prawn sandwich brigade” at Man Utd. In the second half West Ham upped their tempo, and brought on Song, Sakho and Amalfitano as the game wore on. We ended up having a few chances, but Costa scored a brilliant second and Chelsea continued to pepper the West Ham goal. Our keeper, Adrian, must have been our man of the match. Chelsea were at their very best, and showed why they are top of the Premier League. But I can’t help but feel that we let them settle into superiority. I’m sure we could have ruffled their defence with a more aggressive attacking strategy early on. It showed that the belief isn’t quite there yet. But, hey, no real complaints – we were playing the best team in the League, on their turf. So 2-0 to Chelsea. No great disaster. Back to the restaurant for more food…and drink. An array of cheeses, finished off the Malbec, a Guinness for the road. Watched a bit of Man Utd v Newcastle on the TV. Left at 3,30. Only 3.30! It had already been a pretty full day. I walked back to Hammersmith in a cold drizzle and then joined my family at my wife’s brother and Dad’s for Boxing Day nibbles and drinks. I was reasonably coherent still. I think. Normal service resumed. A good day at the Bridge, despite the loss. With thanks to Dave and all the people in the restaurant who made me so welcome. 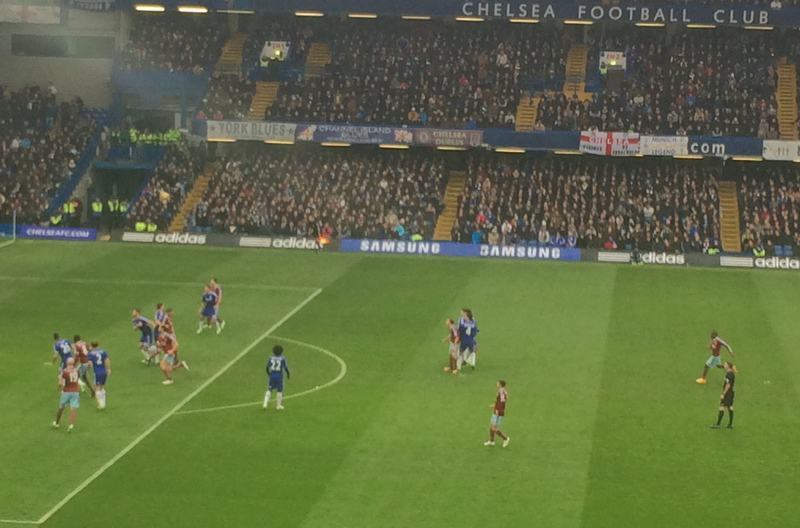 This entry was posted in Sportsthoughts and tagged Boxing Day, Chelsea, Chelsea 2 West Ham 0, football, London, West Ham. Bookmark the permalink. “Ask and you shall be given”. Felt like that after my request for an EPL piece yesterday 🙂 Nice. Your wish… no, it was planned! Half term report on the PL coming up when I get time. Of course it was planned. I was just pretty pleased with the coincidence. Looking forward to that mid-way report. A great write up John. A Boxing Day to savour. You obviously reserve the word “majestic” for the very best midfielders. I agree and thought Fabregas was brilliant on the day. I wonder how he would have fared back at Arsenal. It’s a brilliant day out. Of course I’d have loved for West Ham to have won, however, it seems like it was a winner day for food & drink!